There was once a Capuchin Brother at Our Lady of Grace monastery in San Giovanni Rotondo who was assigned to help Padre Pio with many of his daily tasks. The Brother had a great devotion to Padre Pio and performed his work in an exemplary way. Every morning between 4:00 a.m. and 4:30 a.m. he would go to Padre Pio’s cell to assist him. The routine was always the same. Padre Pio would be sitting in his chair either reading his breviary or praying the Rosary. The Brother would then kiss his hand and proceed to straighten the covers on his bed and do other simple tasks in his cell. One night, the Brother had a terrible dream. In truth, it was a nightmare. In his dream, Padre Pio was elderly and very ill. He was withdrawn and hardly able to move or speak, and it seemed as though he was about to die. In the dream, there was also another Padre Pio. He was floating in the air high above and was smiling, suffused with a beautiful light. But the Padre Pio that was predominant was the suffering one. When the Brother woke up, he was so upset that he burst into tears. He thought that the dream might have been a premonition of the future. Perhaps as Padre Pio grew older, his sufferings would increase more and more. The Brother’s dream occurred in 1957. Padre Pio’s hospital, the Home for the Relief of Suffering had just recently opened. Padre Pio was busy, not only with the many concerns of the hospital but also with the expansion of the Prayer Groups that he had founded. In addition, there was a steady flow of pilgrims who constantly poured into San Giovanni Rotondo in order to attend Padre Pio’s Mass and make their confession to him. While his heath was not the best, he was still able to accomplish a great deal of work each day. He seemed to have the necessary energy to do so. The Brother could not get the disturbing dream out of his mind. He went to the little monastery chapel of Our Lady of Grace and with tears in his eyes, he prayed before the tabernacle. “Jesus, I beg you,” the Brother prayed. 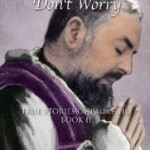 “Please do not let anything bad happen to our Padre Pio. He has already suffered so much. I know that he belongs to you but he belongs to us too and we love him. Do not let his sufferings increase. Give them to me instead. I don’t want Padre Pio to have to endure any more suffering.” After praying at length in the chapel, the Brother made a great effort to put the dream out of his mind. He decided not to tell anyone about it. The next morning, the Brother was at Padre Pio’s door at the usual time of 4:30 a.m. Like always, he found Padre Pio sitting in his chair, reading his breviary and preparing for the early morning Mass. The brother greeted him and kissed his hand. Much to his great surprise, Padre Pio slowly rose for his chair to a standing position. 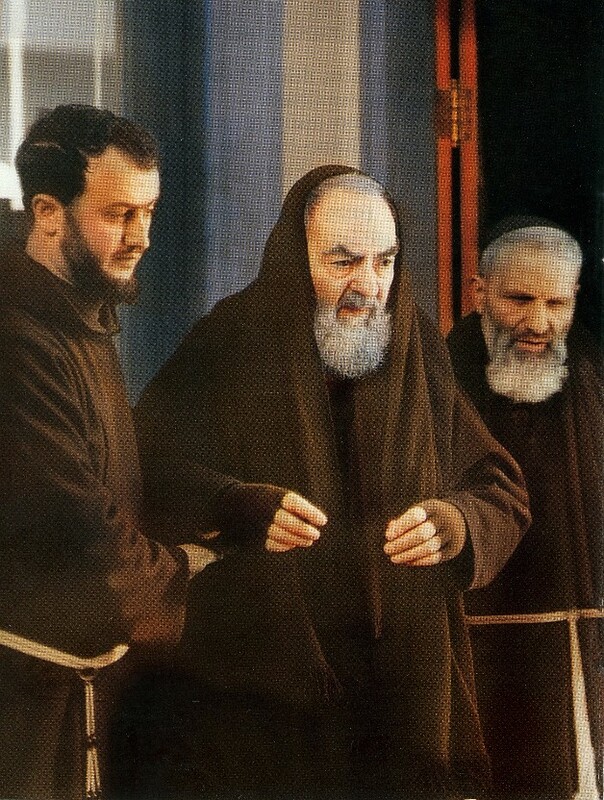 Padre Pio then embraced him and said, “I want to thank you my son, for what you did for me last night!” Padre Pio had felt the prayers that the good Brother had offered up for him and he was very grateful. When Susanna Berghi’s son slipped into a coma, the doctor could not offer her any hope of his recovery. One day while at his bedside, Susanna fell asleep and dreamed of Padre Pio. The dream was very beautiful. There was one detail which particularly struck Susanna. Padre Pio blessed her son three times and said, “Bring him to me.” She awoke and saw that her son was conscious and that he no longer had a fever. He made a complete recovery. Tony Cavaliere was searching for truth and enlightenment through the comparative study of world religions. At the same time, he decided to add a number of spiritual disciplines to his daily routine. Instead of finding inner peace and fulfillment through such practices, he began to experience a growing sense of anxiety. Fear and apprehension became his constant companions. He went to various doctors, trying to find help but to no avail. Tony experienced frequent anxiety attacks as well as dizzy spells. As time passed, his symptoms grew worse and finally became debilitating. He was no longer able to work and he wondered if he would ever be able to live a normal life again. When he learned about Padre Pio, his interest was sparked. He told his wife that he would like to make a trip to San Giovanni Rotondo so that he could pray at Padre Pio’s tomb. Although he was a fallen away Catholic, he was familiar with the Church’s teaching regarding the intercessory power of the saints. Tony and his wife were finally able to make the trip to San Giovanni Rotondo. They visited the monastic cell where Padre Pio had lived for many years. They were able to see the church where he had celebrated Mass and to pray at his tomb. Everywhere Tony looked, he saw familiar signs of faith and the tranquil surroundings gave him a feeling of great peace. After Tony and his wife returned home, his sister-in-law told him that she had an unusual dream. In her dream, Padre Pio was hearing her confession. She spoke to him and said, “Why don’t you give Tony back his health?” Padre Pio smiled at her and said, “Tell Tony that he will be fine.” In the dream, Padre Pio was holding a blue pillow with a Rosary on it. “Give this Rosary to Tony,” Padre Pio said. The dream gave Tony the assurance that he would recover from his debilitating illness. One year later, he was in good health and good spirits, free from all of the symptoms that had previously made him ill. He returned to the practice of his Catholic faith and also became very devoted to the Rosary. “I am dedicated to spreading the message of Padre Pio, the Rosary and the Catholic Church that brought me the peace of Christ,” Tony said. Settimo Manelli once had a dream in which she saw Padre Pio in the glory of heaven. His face was transfigured with a great beauty. Everything around Padre Pio shone with a marvelous light. Especially beautiful was the intense and vivid color of the blue sky. In order to provide a better life for his family, Andre Mandato decided to move with his wife and children from Bologna, Italy to the United States. He sent in his application and all of the necessary paperwork, requesting a permanent visa to the United States. One night, Andre dreamed that Padre Pio spoke to him and said that his application had been rejected. “Andre, if you turn in another application and choose a new sponsor, you will be accepted,” Padre Pio said in the dream. When Andre woke up, he could not stop thinking about Padre Pio’s words. Could it be true? That very afternoon, he learned that his application had been rejected. He followed Padre Pio’s advice by selecting a new sponsor. He also submitted another application and soon received a permanent visa for the entire family. One of Padre Pio’s spiritual daughters was hired to work in the sewing room at Padre Pio’s hospital, the Home for the Relief of Suffering. Among many other projects that she worked on, she made the very first curtains for the hospital. She was able to have the curtains ready well before the hospital’s inauguration day on May 6, 1956. She also made the nurses uniforms as well as the operating room gowns for the doctors. The woman had a great devotion to Padre Pio. She made several of his brown habits and whenever any of his habits needed alteration, she was called upon to do the work. She always counted it a great privilege. She also used to make the small cushions that Padre Pio rested his wounded hands on when he prayed for extended periods of time in the choir loft of the church. She chose green velvet for the material because it was a color that was restful to the eyes. 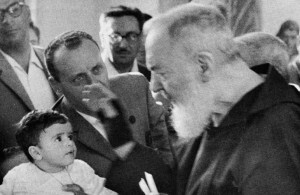 Little Raffaele Mazzone receives a blessing from Padre Pio while his father Vincenzo looks on. Vincenzo Mazzone’s six-month-old son, Raffaele, became seriously ill in 1967. He suffered from a continuous high fever. He was seen by a number of doctors but they were not able to come to an agreement regarding a diagnosis. He was given varying treatments and medicines but his health did not improve. On the contrary, he was becoming weaker with each passing day. During this time of uncertainty and anxiety regarding little Raffaele, Vincenzo’s wife had a dream. In her dream, Padre Pio was standing at a window, opening the curtains. He told her that little Raffaele should be in a place where the air was fresh. Then the dream was over. After she told her husband about the dream, they decided to make a trip from their home in Cerignola to San Giovanni Rotondo. Although it was difficult, they managed to get an immediate appointment with the pediatrician at the Home for the Relief of Suffering. When the pediatrician examined Raffaele, he could find nothing wrong with him. His temperature was normal and he appeared to be in perfect health. Vincenzo and his wife were elated. The next evening, Vincenzo went to the sacristy of the church in order to thank Padre Pio for his intercession. As Padre Pio passed by, Vincenzo knelt down. He had little Raffaele in his arms and he held him up to Padre Pio. With a slight smile, Padre Pio stopped and gave little Raffaele a blessing. My thirteen year old sister Bernadette was paralyzed from birth. She was very bright and very pretty. In the last year of her life she suffered great sickness and severe pain with very little sleep or rest. She always wore a relic of Padre Pio pinned to her vest. One morning, Bernadette told us that she had slept all night and that a lovely man appeared at her bedside during the night. She said he wore a long dress with a rope tied around the waist and he had a beard. He told her he was taking her away to a land where she would have no pain or sickness ever again. Upon hearing this, my mother became very upset. The man held her hand and she said she was not afraid because he was a holy man. Bernadette asked him to leave her here a little bit longer. She talked about the “holy man” all the time. As the days went by we all knew she had seen somebody because she seemed so peaceful. Six weeks later, on June 1, 1978 Bernadette died with no pain. Padre Pio appeared to my little sister and took away her fear of death and guided her gently from this world to the next. After suffering for ten years, in December, 1983, I started the novena to Padre Pio. In February, my condition grew worse. My ankles became swollen and the pain was unbearable. On February 10th, I was healed in a dream. I was in a beautiful chapel and Padre Pio came to me. He told me to sit and then he touched my swollen ankles. He touched my back and then he said, “Get up and walk. You are healed.” I awoke immediately from my bed and I walked without a single pain in my body. That morning I attended Mass to thank our Lord. The pain came back, but only for a moment because soon what felt like a warm hand touched my back and took my pain away. I have never known that pain again. Once, while on a job-hunting trip, I checked into a motel for the night. Several people who were at the motel made me feel uneasy. I began to feel a concern for the safety of my car and I hoped that it would not be vandalized in the night. Before I went to bed, I prayed and asked Padre Pio to watch over me and protect me and also my car. That night, I had a dream. In the dream, I was laying on my right side, and Padre Pio came and shook me awake saying, “Brenda, I think you’d better get up now.” When I woke up, I was laying on my right side, just like in my dream. I looked at the clock and saw that it was 3:00 a.m. I was so groggy, that I fell asleep again. I then had a second dream in which Padre Pio shook me once again, saying with greater emphasis, “Brenda! You had better get up now!” At that, I got up and looked out the window. Sure enough, the two fellows who had concerned me after I checked in to the motel were at my car. One of them was under it! They left hastily when that saw me at the window. I am convinced that Padre Pio heard my prayer that night and came to my rescue. My son Frankie was diagnosed with Osteosarcoma (bone cancer) in July of 2005. He fought a long and hard battle against this illness for twenty seven months. He had four lung surgeries, amputation of his leg, radiation, and countless rounds of chemotherapy. He also developed a secondary cancer, leukemia. During his ordeal, Frankie kept hopeful and prayerful. He kept Jesus as the center of his life, and prayed to his patron saint, Padre Pio, whose picture he always kept with him. Frankie died on Sept. 14, 2007. He was 17 years old. The morning of Frankie’s Mass of Christian Burial, my family and I were at the funeral home where there had been a public viewing of Frankie for two days. When it was almost time to say goodbye to my son and go to St. Ephrem’s in Brooklyn for the funeral Mass, I felt my strength failing me. I dreaded this final time, knowing I would never see my son again. At that moment I prayed to Padre Pio, begging him to help me. The moment I finished my prayer, into the funeral home walked Ray Ewen. Ray had met Padre Pio in 1945 when he served in the U.S. military and was sent overseas to Italy. Ray has been a great promoter of Padre Pio ever since. Ray prayed for my son and he prayed for me. As he prayed, I felt a great sense of peace come over me and I received the strength I needed so badly. I know that Ray’s presence was an answer to my prayer. Ray does not live close by but he told me that when he woke up that morning he felt a very strong urge to get to the funeral home and see Frankie. It was not easy for him but he managed to find a ride with a close friend who was also very devoted to Padre Pio. The celebrant of Frankie’s funeral Mass was Father Gerard Sauer. He was joined by four others priests and over 1000 people attended. Two beautiful eulogies were said, one by Frankie’s best friend, Gennaro Anzalone and the other by Dr. Joseph Marino, the Principal of Frankie’s school, Xaverian High School in Brooklyn. Dr. Marino told all present about Frankie’s faith in God and his devotion to Padre Pio. In July of 1992, I was diagnosed with lymphoma. I went through 6 months of chemotherapy. One night my son asked me if I had ever heard of Padre Pio and he told me a little bit about him from a program he had seen on television. My son is not very religious but was quite taken with this man at the time. Sometime shortly after this I had a dream. In my dream I was out walking alone and saw a group of people. I made my way toward them. As I approached, the others seemed to vanish and the back of this man, whom I thought was Jesus, drew me closer. As I went to speak, the man turned around. At first I saw his gentle face and then his eyes. Rays shot from his eyes and went through me. I woke up. My friend gave me a prayer card of Padre Pio. Imagine my surprise when I looked and saw that it was the man in my dream. I told my friend of my dream and she saw it as a sign of healing from my cancer. I’ve thought of that ever since. I just finished my first year of tests and the cancer shows no signs of recurrence. I recently had a very vivid dream in which I was walking with a man who was carrying a lantern. He was limping slightly as he walked and his posture was somewhat bent. He had a serious demeanor and I noticed that he seemed to be in a hurry. He spoke to me in Italian and said that a very important day was coming soon. I understood the Italian words in my dream even though I do not speak the language. Then the dream ended. I told my good friend Tony Fajardo about the dream and he then showed me a picture of Padre Pio. There was no doubt about it. He was the man I had seen in my dream. I knew practically nothing about Padre Pio. Tony had told me on a previous occasion that he had the stigmata. That was the extent of my knowledge. I had never seen a photo of Padre Pio before. I did not even know that he was from Italy. In my dream, I felt that Padre Pio was proud of me for finally realizing that the Catholic faith was destined to be a part of my life. This month I am going to begin to take classes so that I can be confirmed. In the dream, when Padre Pio said that an important date was coming up, I thought that he might be talking about his birthday. But since then, I have learned that he received the Stigmata on Sept 20 and that his feast day is September 23. I had the dream on September 6. I lost my only son very tragically last year. I was very troubled as to whether my son was happy in his new dwelling. I prayed faithfully and daily to Padre Pio for some sign from my son. One night my son came to me in a dream and told me that God was very just and that he, my son, was happier than he had ever been on earth. I feel that this was more than a dream. Your sole concern should be the establishment of God’s reign in your heart, in this life and in the next. In this life, your study should be to bring about this reign of God, in your heart by his grace and through the plentitude of his love. You should live for God alone, and the life of your soul should be the life of God himself. You ought likewise to nourish yourself with God by thinking of his holy presence as often as you possibly can. That which constitutes the life of the saints is precisely their continual attention to God and this also should form the life of those who . . . seek only to accomplish his holy will, to love him and so make others love him. 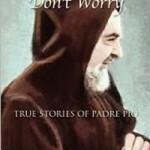 Pray, Hope, and Don’t Worry:True Stories of Padre Pio Book I – written by Diane Allen, published by Padre Pio Press, and available at amazon.com Click on the “Books” link at padrepiodevotions.org for more information. written by Diane Allen, published by Padre Pio Press,and available at amazon.com Click on the “Books” link at padrepiodevotions.org for more information.